"Why Can't I Sell My Articles?" I think most travel story ideas are worthy of publication somewhere. If you spend some time researching the destination, you can usually find a marketable story idea. 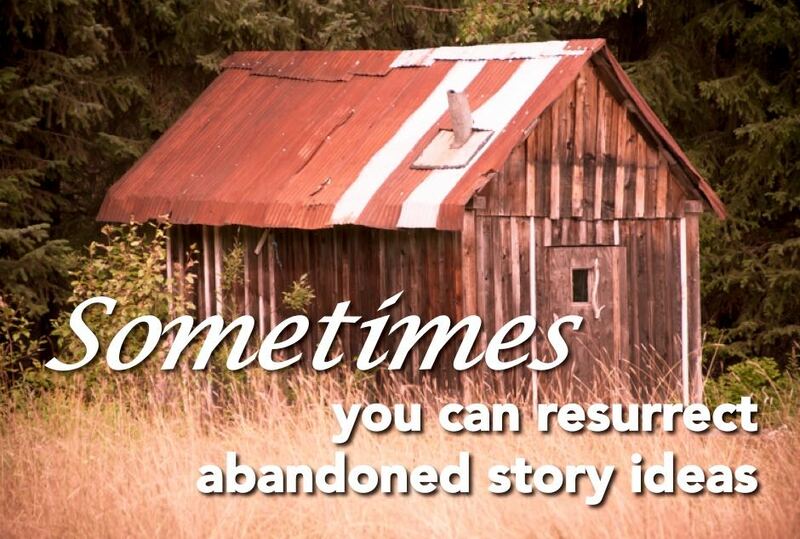 It’s true that sometimes you’ll have to abandon a travel story idea. If it doesn’t have enough “jam” to hook an editor, you won’t be able to sell it. That’s the sad reality of travel writing. But it’s more likely that you just need to do a little work to discover what’s so interesting about a place and to clarify your unique story angle. Some writers think mentioning a place in the subject line is a pitch. It’s not. Writing the name of a place in the subject line of your query letter and expecting the editor to fill in the blanks simply won’t work. The name of a place isn’t a travel story idea. When you tell an editor you want to write a story about a place, it only says you’re planning to take a trip to that place. It doesn’t tell the editor what the story is about. If your query is about Paris, editors know in general terms what “Paris” means, but they don’t know what you’re planning to say about it. 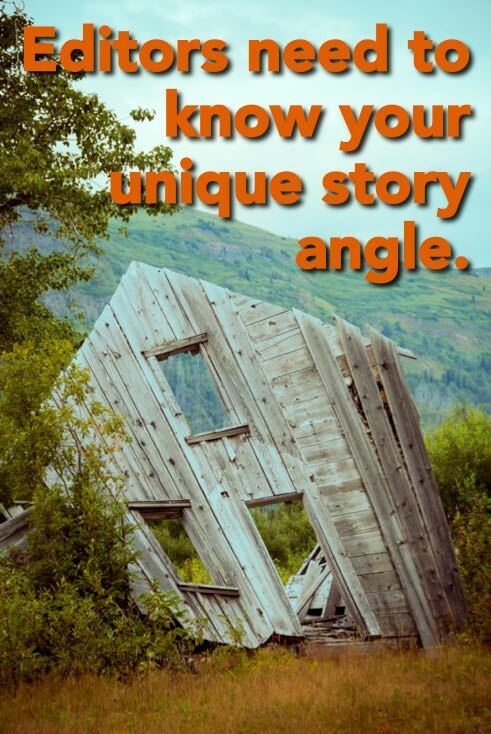 What’s your story angle? Why would someone want to read your story instead of just reading a Wikipedia article? Why would an editor want to pay you to write about Paris - or any other place? No matter how much a place excites and interests you, you have to figure out how to make it jump out and interest an editor. That’s how a travel story idea is sold. The good news is that within every vague story idea, there’s usually a unique angle waiting to be uncovered. 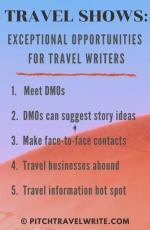 It’s up to you, the travel writer, to find the topics that are most interesting and do enough research to turn them into something an editor wants to buy. You need to develop your story ideas in enough depth to describe it to an editor. He needs to find it attractive enough to want to publish it. In my coaching practice, when my writers send me their query letters for review, I find most of them have good ideas. But often their query letters are scant on details and need some serious beefing up. The first thing I tell them to do is develop their travel story ideas by doing some in-depth research about each story idea. Dig out the information that makes your story idea unique and interesting. Write up a couple of paragraphs about the destination, including the interesting facts, figures, or unique details about the place. This helps you to flesh out your ideas. When you include this information in your query letter, it gives the editor far more than just a working title or the name of a place. It tells them the “who, what, where, when and why” about a place. 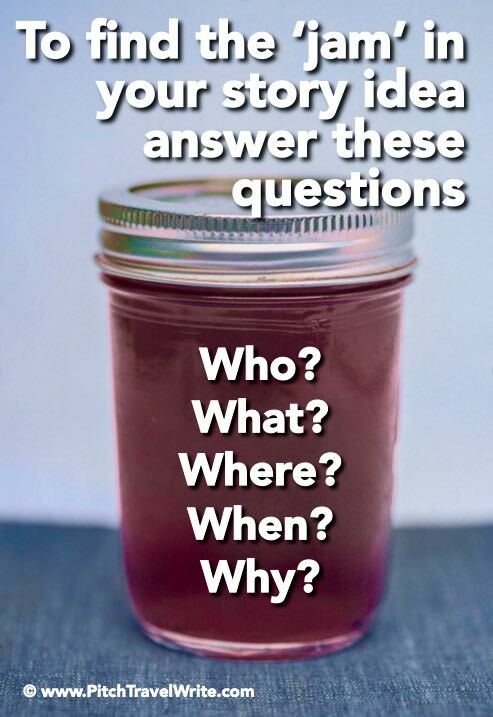 Those are the questions you need to answer in your query letters. Magazine editors need to know the special angle for your story. What is it about the attractions or the destination that is special and sets it above other similar places? Tell the editor as much as you can about your travel story idea in your query letter. Editors don't mind reading a long pitch as long as your query letter is full of relevant details. Tell them your angle. Send facts, links, and any other information that will hook the editor and make him interested in buying your story. After you do your research, if you still can’t find anything unique about a place, you need to be prepared to walk away from the story and dream up another idea. Which brings me to the more troublesome side of things - stories that are hard to sell. There are so many cruises offered these days that a story about any of them is a hard sell. No matter how exciting the cruise is to you personally, there must be something very special about the cruise or the destination to persuade an editor to run a cruise story. 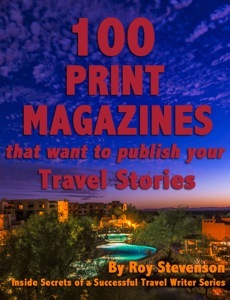 You’ll find this rule even applies to magazines that specialize in cruise travel! Stories found in cruise magazines aren’t about the cruise. Their destination stories usually have an angle. Check out the websites for the four cruise magazines listed at the end of this section and you’ll see what I mean. 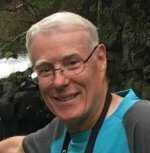 Is it possible to sell a cruise story? Yes, but only if you focus on an interesting angle. You need to find out what makes it unique and interesting. • Is it the first time this cruise has gone to a particular destination? Is it the first cruise line to venture into this territory? Maybe there’s a story there. • Are there any famous personalities on board that you can interview and make into a story? Who might be interested in reading an article about these personalities? What publications do they read? Pitch those. • Does this cruise have a theme that will be interesting to a wide audience? Who would be interested in hearing about this theme? Does it fall into a specific genre? Pitch to those magazine genres. • Delve deeper into what each stopover port-of-call has to offer. What’s unique about each of those destinations? 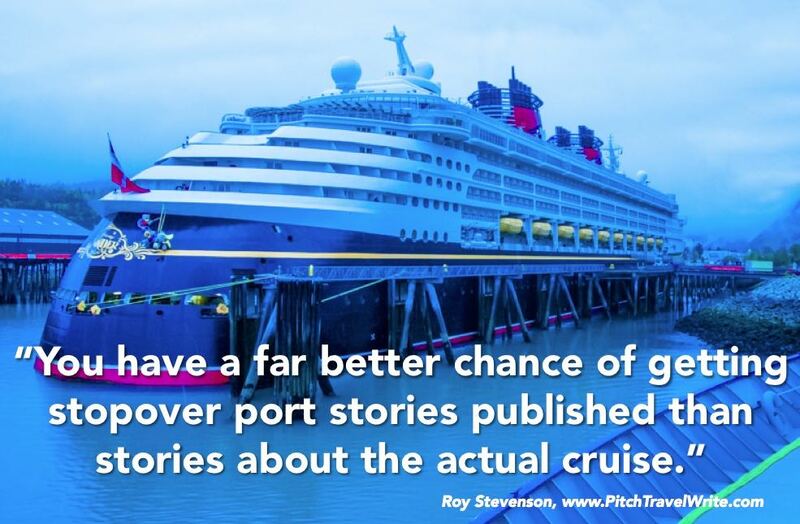 You have a far better chance of getting stopover port stories published than stories about the actual cruise. Any standard tourist attraction is a hard sell unless you can find something unique and distinctive about it. Swimming with dolphins, snorkeling, catamaran rides, visiting historical sites, touring museums, photographing architecture, zip lining, jungle experiences, and canopy tours aren’t unique story angles anymore. These activities may seem exciting to you (and I enjoy them too! ), but they’ve all been beaten to death in travel magazines. The real takeaway message is to research your travel topic thoroughly before you pitch it. Dig out what is so special about the place, to see if the story is actually marketable. If it's a standard tour that takes in the standard sights, it will be a hard sell. Always remember, that just because you are excited about a place or tour, that doesn't mean magazine editors are going to be. You have to find out what is so exciting about the destination and sell that to the editor. And, sometimes, after you’ve abandoned a story idea, it’s worth resurrecting it and trying to sell it again. Several times I’ve put stories on the back burner that didn’t seem to have enough juice. Then, years later, I’ve revisited these stories and managed to sell them. What made them different the second time around? In most cases I sold them to an editor who knew me and was familiar with my work. Once I had forged a solid working relationship with these editors, my back burner stories were happily accepted for publication. 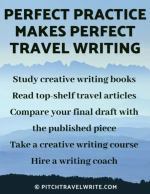 Freelance travel writing is as much about developing relationships with editors as it is about being a good writer. But that’s a topic for a different article. For this one, just remember you might be able to resurrect some articles that you previously abandoned. Never give up. Just keep pitching.